By definition, industrial maintenance is a continuous process of reworking and adjusting equipment to keep it operating at peak effectiveness. Repetition of tasks is a maintenance fact of life. 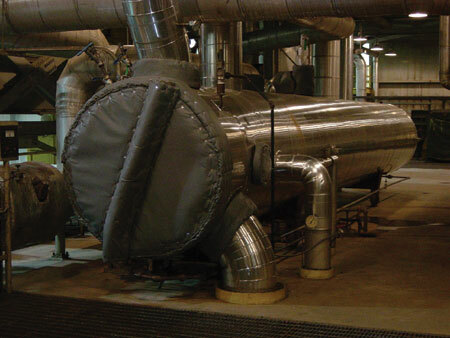 Today, maintenance managers and building owners alike are recognizing the benefits of removable insulating blankets for their ability to break the repetitive cycle of maintenance downtime and expense. In contrast, removables provide a repeat performance in cost and time savings. Years ago, when removable insulation blankets were first introduced, rigid insulation was the common method of insulating industrial equipment. Odd-shaped equipment, valves or pipe, and equipment that needed frequent maintenance, were often not insulated at all. Selling maintenance managers on the idea of removable blankets was a bit tougher because the initial price was higher than rigid board, or the managers just didn’t feel insulation was necessary. Now, that’s changed. Industrial operations are under continual pressure to reduce downtime and enhance productivity, and to produce more while spending less. As rising fuel prices eat away at profitability, building owners and maintenance managers alike are fine-tuning their operations – and removable insulation blankets are viewed as a key element in achieving best practices. 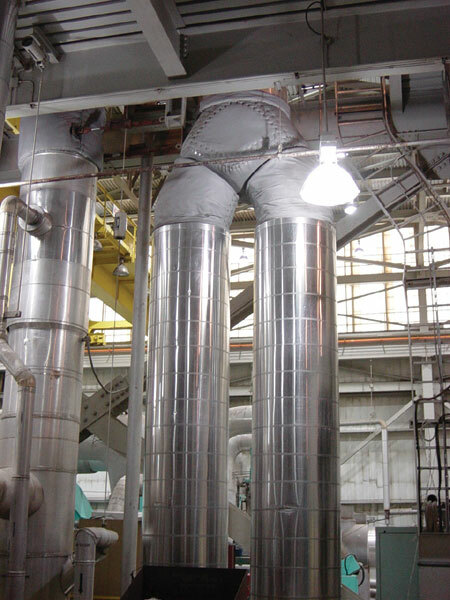 In fact, removable blankets are increasingly the insulation of choice for flanges, valves, expansion joints, heat exchangers, pumps, turbines and other irregularly surfaced – or frequently maintained – equipment. The simple beauty of removable insulating blankets is the concept of "once and done." Once the blankets are fabricated, they can be removed, reapplied and reused. This is in sharp contrast to traditional rigid insulation, which tends to deteriorate if subjected to the continual application and removal common to equipment that needs frequent maintenance. For example, maintenance involved in packing valves requires removing insulation at least annually. The rigid board insulation typically used tends to break apart when removed. So, new insulation needs to be applied during each maintenance cycle, adding to costs and extending downtime. Insulation of steam lines is another application where traditional insulation presents a problem. If the lines are insulated with rigid pipe covering, the covers need to be cut away in sections in places where maintenance is required. Sometimes it goes back on. More often the line is left exposed. In these and many other applications, removable blankets offer an excellent solution. They come off quickly, and go on easily, without degradation. When properly stored, a blanket can easily last five to 10 years. Figure 1 illustrates the long-term installation and re-insulating cost benefits of using removable blankets versus traditional oversized pipe coverings. The evaluation was performed assuming 10, 6-inch valves, insulated both traditionally and with removable blankets. Although the initial cost for removables was slightly higher, these costs were recovered and additional savings were realized after the first round of maintenance. Despite rising energy costs, and the obvious benefits of insulation in controlling energy usage, some maintenance managers opt to leave problem areas uninsulated. This is often the case with irregular surfaces, environments where water, oil or other liquids tend to drip and degrade traditional insulation products, equipment that is hard to access, or in places where frequent maintenance is required. Removable insulation blankets can be fabricated to fit any surface or equipment configuration. Special fabrics can be incorporated to resist leaking liquids, and removable blankets are ideal for situations requiring continual removable and reapplication. These capabilities offer the opportunity to achieve dramatic savings in energy costs when removables are applied to previously uninsulated equipment. Here’s an example of the savings one plant achieved by covering previously uninsulated valves with removable insulating blankets. In less than six months, the plant’s energy cost savings covered the original cost of fabricating and installing the removable blankets. 1. A 600 F operating temperature and a 6-inch valve size were used to determine that 8,270 Btus per hour would be saved by installing removable insulation covers on the valves. 8,270 Btu per hour x 8,760 hours x 0.80 = 58 MMBtu. 58 MMBtu x $8/MMBtu = $464 per 6-inch gate valve. Removable blankets at an installed cost of approximately $200 each = 5.2-month return on investment. 3. Multiply the savings by the number of valves to be covered. In this plant, there were 12 uninsulated valves; so the annual energy savings would be just about $5,568. Through an initial investment of $2,400 for the blankets, this plant realized a net savings of more than $3,168 the first year, and then $5,568 per year thereafter – a substantial addition to the bottom line. Leaving high temperature equipment and surfaces exposed creates a burn hazard for industrial workers. But, all too often this is the situation when equipment requires frequent maintenance and workers need to get to it quickly. Because insulating with traditional materials would require continual removal, disposal and reapplication, many plants opt to forego insulating these areas at all. A heat exchanger in one plant illustrates the potential danger. This vessel was 5 feet in diameter, 40 feet long and operated at a temperature of 450 F. Employees continually needed to access the upper level for maintenance; so it was left uninsulated. The situation was extremely hazardous for employees, and the energy loss was costly to the plant. A removable insulation blanket offered the perfect solution. Custom fabricated for the vessel, the removable blanket enabled energy recovery and dramatically reduced the safety risk. To create a removable blanket, an engineer conducts an evaluation of surface temperature and heat flow. An insulation mechanic then takes precise measurements of the equipment to be insulated. The type of facing material needed and the fastening system required are considered, as are environmental factors and safety concerns. The right combination of materials is ordered, and the blankets are then fabricated on site to assure an exact fit. Continual advancements in materials enable the fabrication of blankets that meet every objective. Some plants also request that blankets be labeled with an identification number to correspond to the valve the blanket was designed to cover. This is a huge advantage for plants during a shutdown where hundreds of valves are being maintained. The bottom line advantage of removable insulation blankets is that they remove barriers to achieving peak performance – in energy savings, cost control, downtime reduction, productivity and worker safety. Maintenance managers looking to streamline maintenance operations, and business owners intent on sustaining profitability, will both applaud the benefits of a product that provides ongoing encore performances in both areas. Removable insulating blankets are ideal for insulating irregularly shaped equipment like this heat exchanger. In this application, the blankets also provide ground-level personnel protection. 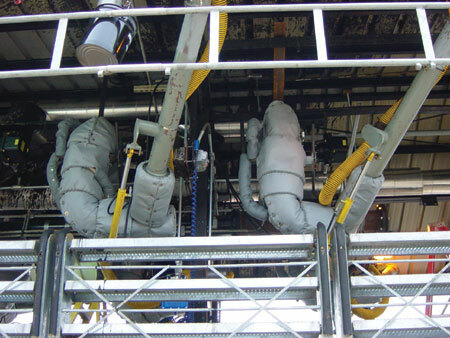 Custom blankets insulate the intersection of two 900 F steam lines in a power plant application. Long-term cost analysis — traditional versus removable. Removable insulation blankets provide flexible protection for the rotating arms of piping used to convey oil to tank trucks.